It would take nearly 20 years after the debut of Superman before the first black comic book main character was introduced. Still maintaining the “mysterious and noble savage” stereotype, Waku, Prince of the Bantu was featured in the omnibus, Jungle Tales, from Marvel Comics’s 1950’s predecessor Atlas Comics. The seven-issue series, Jungle Tales (Sept. 1954 – Sept. 1955), which introduced Marvel’s first African hero, was renamed and continued as Jann of the Jungle from #8-17 (Nov. 1955 – June 1957). Jann of the Jungle still included Waku, but the title character, Jann, represents another unfortunate stereotype; Jann was a white savior. The white savior trope—white characters who travel to exotic lands and learn the secrets of the people, thereby becoming more powerful than both other white people and the native brown people—was a classic narrative theme from Jann to Tarzan to the Shadow. The depiction of a black (African) mainstream comic book character as a strong, independent hero in Jungle Tales was a new thing in itself, but Waku in his first iteration was also an African chieftain in a comic with no regularly featured caucasian characters. To have a mainstream comic feature nothing but black characters was ground breaking, but may also have been why the series was as brief as it was. Lobo#1 (Dec. 1965), the first comic book with an African-American star. Moving forward only one decade, we find Lobo, the first black character to be the title character in a comic . . . no, this Lobo is not the ironically, completely chalk-white Czarnian, but a solitary, brown-faced western hero. Only lasting two issues, Lobo chronicled the adventures of an unnamed African American gunslinger who operated similarly to the Lone Ranger or Zorro, traveling the American West and doing good deeds, all while being wanted for a crime he did not commit. As his calling card, Lobo would leave a gold coin imprinted with the images of a wolf and the letter “L“ on the forehead of villains he defeated. According to one of the comic’s creators, Tony Tallarico, it ended because many comic sellers did not like the idea of a Black hero (he was featured on the cover) and were returning bundles of the comics unopened. They printed 200,000 Lobo issues, but only sold 10-15 thousand. And that is what it was for black characters for the first nearly 30 years of comic books. Black characters were okay as exotic noble savages or outlaws doing right, but could not be in a mainstream role without a qualifying stereotypical element. In fact, when it was tried, such as the story, “Judgment Day”, in Incredible Science Fiction#33 (Feb. 1956), the powers that be attempted to censor it. The story ended up being reprinted only because the Comics Code Authority (CCA) had rejected another story. The last panel of the Judgment Day story, revealing the main character to be Black. In “Judgment Day”, a human astronaut emissary visits the planet Cybrinia as a representative of the Galactic Republic. The planet is inhabited solely by robots, who are divided into functionally identical orange and blue races, one of which has fewer rights and privileges than the other. 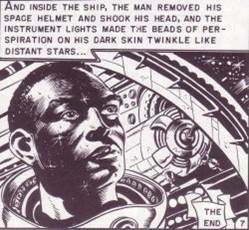 The human astronaut turns down their application to join the Galactic Republic because of this bigotry, and in the last panel, removes his helmet, revealing— much to everyone’s surprise—that he is a Black man. The CCA insisted that he be removed or color changed. The comic’s editor, William Gaines, stood his ground, threatening the CCA with a lawsuit should they proceed to censor the story. The CCA eventually backed off and the story stood, but it was indicative of what challenges were faced by black people in the 1950’s and 1960’s. The first appearance of Wakanda’s Black Panther. That would change, however, in 1966, when Marvel Comics introduced the first Black superhero in mainstream comic books. Appearing in Fantastic Four #52, Black Panther was still an “exotic” African character, but this time the character had not abandoned his role (or it was a background feature). Black Panther was leader of the most technologically advanced nation in the world, and an African one at that. He bested other mainstream heroes like the Fantastic Four and the Avengers, eventually becoming a member of both teams. He was smart, capable, and his own hero. He paved the way for what was to follow—a ground breaking list of firsts, primarily from Marvel, heralding a new age of brown people in leading roles. Marvel seems to have been on a special timeline because they followed the introduction of Black Panther with the first African American superhero three years later, Falcon. Three more years later, they introduced the first black superhero to star in his own book, Luke Cage, Hero for Hire in 1972. Following that, Marvel debuted the first African America female superhero with the introduction of Storm in 1975’s Giant Size X-Men #1. DC Comics made similar efforts with the 1971 introduction of the Black Racer of the New Gods, and the 1972 introduction of John Stewart as a Green Lantern. The introduction of the Falcon, the first mainstream African American superhero. Falcon debuted in Captain America #117 (Sept. 1969), and made it 6 years before his background was retconned to fit a racist stereotype. Originally he had been a social worker who ended up on an island because of his falcon training skills, which ended up being populated by the Red Skull’s former underlings. He had been trying to organize the natives to take a stand when Captain America turns up and trains him, before he assumes the role of the Falcon to fight the villains.